You can't go anywhere in the Fox Valley area and mention the name Harner's without peoples' taste buds kicking into high gear. We have been a well known local favorite since 1960 and we are glad to serve you! We continue to operate with the original Harner's philosophy, make the recipes in the same good old fashioned way, keep friendly neighborhood employees and exercise a strong work ethic. Most of the restaurant food and our baked goods are still made from scratch here in our own kitchens. Darryl Harner started working for Ochsenschlager's Bakery in 1956. After working there for four years, Ochsenschlager put his business up for sale. In 1960, Darryl and Joyce bought the business from him and dreamed of what the future may hold for the Harner family. That first Harner's location, at 935 W. Galena Blvd. in Aurora, was a bustling neighborhood bakery with a counter and stools where you could get a burger or home cooked breakfast. This original Harner's location remains in operation today as a coffee and donut shop. In 1977, Darryl and Joyce with their seven children opened another Bakery and Restaurant in the Northgate Shopping Center. With the family working together, the Harner's business continued to grow. In 1989, Darryl purchased an empty lot along the Fox River in North Aurora. 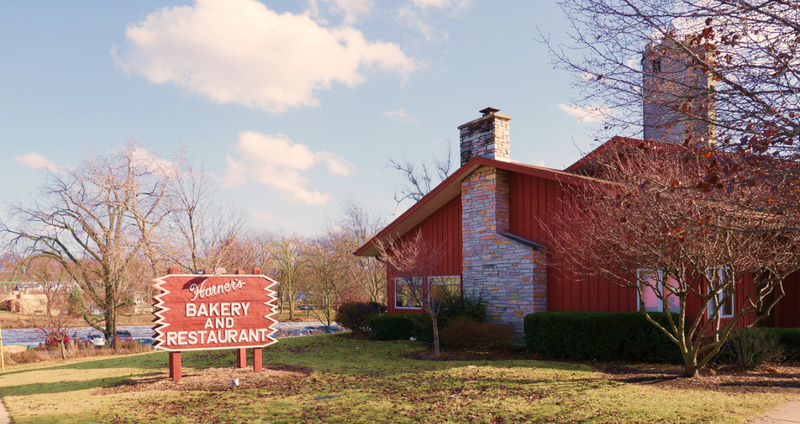 In 1993, the family opened what is now the current Harner's Bakery, Restaurant & Catering.